Our experts specialise in Solar Water Heating, Heat Pumps and Solar Photovoltaic Electricity and are MCS accredited to carry out all work within this field. As an environmentally aware organisation, we at BSW acknowledge our responsibility to promote renewable energy technology to help our customers reduce their carbon footprint. And with the Domestic Renewable Heat Incentive scheme (RHI) it has become even more beneficial. Alongside the high efficiency condensing boilers which we routinely supply and install, BSW has developed services to provide renewable and sustainable energy solutions for generating electricity, central heating and hot water. BSW are qualified under the Microgeneration Certification Scheme (MCS) to design and install renewable energy systems including Solar Photovoltaic (PV) panels, Solar Thermal, Air Source Heat Pumps and Micro Combined Heat & Power (Micro-CHP). Our accreditation entitles our clients to the full range of government grants which are available to them when investing in these technologies. Our clients are also eligible under the ‘feed-in tariff’ to receive periodic payments for the renewable energy that is generated from their solar panel installation. Similar grants, such as the Renewable Heat Incentive (RHI) enable our clients to benefit from the RHI tariff for the installation of renewable heat systems including solar thermal, biomass boilers and heat pumps. Our MCS accredited Renewables team are comprehensively informed on the funding opportunities and benefits of these state of the art technologies and are able to advise you through the entire process of evaluating and specifying the best solution, as well as designing, installing and maintaining the system of your choice. 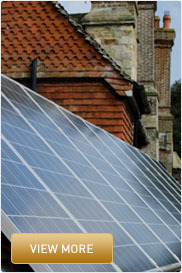 For more information on our range of renewable energy products, please click on the links below. "Excellent, fitters had to wait for delivery of tank from 3rd party it was very late but they worked till 10pm to complete in one day"